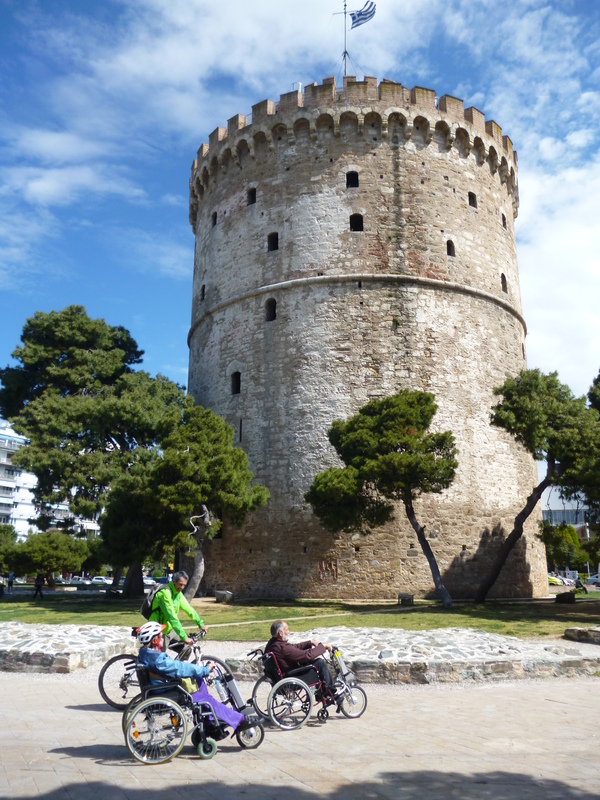 The walk along the coast of Thessaloniki, from the music hall to the harbor, is only the beginning of a unique experience that climaxes with the ascent of people with disabilities to the White Tower! With the help of the off road vehicles available by the Health Guardians organization and the techniques of its qualified escorts, people with disabilities enjoy for the first time the view and the seductive sunset from the first level of the White Tower. Provided equipment: Electric wheelchair & off road wheelchair for the White Tower. Highlight: Ascent to the white tower (first level). Main attractions: White Tower, Umbrellas, parks, the statue of Alexander the Great, the coast, Aristotelous Square, the harbor, the shopping center, the statue of E. Venizelos, the Ancient Market (walks, photography, visit the inside of those areas if you wish –we design the ride along with you) *. * This route is possible only if the weather conditions permit it. * For your reservation contact us one day in advance.